For the cheesecake layer, place a large pan on the bottom rack of your oven and fill it with 1-inch of water. Spray you spring-form pan with non-stick spray. Place the cream cheese in the bowl of a stand mixer. Blend until smooth. Blend in sugar and salt until fluffy, about 2 minutes. Beat in eggs, followed by sour cream, heavy cream and vanilla. Blend until smooth. Pour batter into your spring-form pan on the middle rack of your oven. Bake for 45 minutes or until set. Place on a wire rack to cool and remove water pan from oven. Once the cake is completely cool place it in the freezer for one hour. Remove cheesecake from freezer and unlatch the sides. 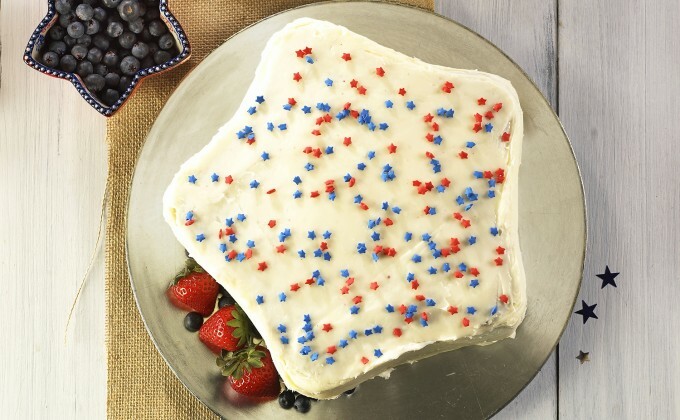 Carefully remove from the pan and cut into a star shape to match the size of your temp-tations® 2 quart star baker. Refrigerate until ready to assemble the cake. For the cake layers, increase the oven temperature to 350 degrees. Lightly spray your temp-tations 2 quart star baker with non-stick spray. If you only have one 2-quart star baker you will need to make the two cake layers in separate batches. In the bowl of a stand mixer beat the butter and sugar until smooth. Blend in the eggs, milk and vanilla. Add in the remaining dry ingredients and slowly blend until smooth. Pour half of the batter into another bowl. Add a few drops of red food coloring to one bowl and blue food coloring to the other bowl, mixing well. Use more food coloring as needed to reach a dark red and blue color. Pour the red batter into your star baker and bake for 25 - 30 minutes or until a toothpick inserted into the center comes out clean. Set aside to cool for 20 minutes. Remove cake from pan and set aside to cool completely. Spray your baker once again with non-stick spray and fill it with the blue batter. Bake for 25 - 30 minutes or until a toothpick inserted into the center comes out clean. Set aside to cool for 20 minutes. Remove cake from pan and set aside to cool completely. For the frosting, place butter and cream cheese in the bowl of a stand mixer. Beat until smooth. Add in flour, salt and vanilla and blend well. Add in half of the powdered sugar and the water. Slowly blend until all sugar is incorporated. Beat in the remaining powdered sugar and more water if needed to reach the desired consistency. To assemble the cake, place the red layer on a platter or cake plate and spread with 1/4-inch of frosting. Lay the cheesecake layer on top. Spread 1/4-inch of frosting on top of cheesecake layer. Lay the blue layer on top. Cover the entire cake with a thin layer of frosting to hold in the crumbs. This is called a "crumb coat". Place in the freezer for 20 minutes to set the frosting. Remove from freezer and cover the entire cake with more frosting. Add some festive sprinkles to the top if desired.